Gmail Labs has a new feature for organizing your messages: Smart Labels. Many people create filters that label messages from mailing lists, newsletters, so Google decided to use artificial intelligence algorithms to categorize messages. Right now, there are only three smart labels: bulk (for newsletters), notifications (for confirmation messages, alerts) and forums (for mailing lists). By default, all the messages labeled as "bulk" are automatically archived, but you can change this setting. "Smart Labels play nice with other labels and filters too. On the Filters tab under Settings, you'll find that these filters can be edited just like any others. From there, you can also edit your existing filters to avoid having them Smart Labeled or change whether mail in a Smart Label skips your inbox," explains Google. In fact, when you create a filter, Google shows an additional option: category. 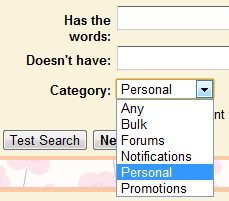 You can choose from: bulk, forums, notifications, personal, promotions. The first three categories already have corresponding smart labels and all the messages classified as "promotions" are labeled "bulk". The "personal" category includes the rest of your messages. Google's categorization algorithms aren't perfect, so you may find messages that don't belong to one of three categories, but they're labeled as "notifications" or "bulk". Use the "labels" drop-down to remove the labels that are incorrectly added and help Google improve its algorithms. Just a warning. These don't play well with Google Apps accounts. While you can enable them via Labs, the "Report Miscategorization" option does not appear in the message drop-down menu and the Category field does not show in the filter options - which means that you cannot edit the default filter effects for the smart filters (eg change bulk to not archive). A ~year after releasing Priority Inbox feature they didn't bother to improve it in any way. Gmail still marks nearly all my emails as important, including newsletters, automated notifications etc. - no matter how often I manually mark them as un-important. It basically has no learning skills whatsoever. Having said that, I'm very much sceptical about their other "automagical" features and definitely won't going to use Smart Labels. It's misclassifying a ton of my mail -- way too much for me to report. I already use my own labels and filters, so I'll probably disable this feature if it doesn't improve. For now it's not hurting anything since I adjusted its automatic filters to not archive mail. This is buggy. For example, I edited the Bulk filter to NOT skip inbox, but still, some e-mails marked as Bulk still skip inbox..I'm just gonna disable this crap.. This is great to make my gmail more organize. how did u disable it ? Works perfect for me. Much more useful then priority inbox. Helps to keep my android notifications clean from not that important mails. Does anyone know if you enable it and then disable it later in Labs do you manually have to go through and delete a bunch of filters? I think that the smartlabels kind of messed up my stuff. See my postings: http://www.google.com/support/forum/p/gmail/thread?tid=36df9920da58b45e&hl=en&fid=36df9920da58b45e0004a7679f817f19. I'm not exactly sure that the smartlabels are the culprit, but it seems so. Now it doesn't works ant more on my gmail ...what the hell!!! Great idea...at least it would be if I could get it too work. For me, unless the messages can be automatically archived away from my inbox there really isn't any point. The "important" priority inbox is a better option. I've gone through each label and corresponding filter setting, activated/deactivated the smart labels lab item twice, still no joy. 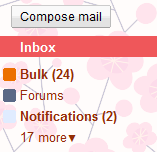 No matter what I do, the bulk and notification messages, while correctly labeled, still show up in my inbox. Once the bugs are worked out, it'll be an awesome feature.